Papaw Lee | Dr. Justin Imel, Sr.
Every October 12 I go back to a small house in the little town of Camargo, Kentucky. I remember parking just off the little road where my grandparents lived because there were far too many cars in the driveway to put my Mazda there. I got out of the car, unbuckled my one-year-old son (well, he wouldn’t be a year old for four more days), and started up the driveway. As I prepared to open the screen door into Nannie and Papaw’s house, Dad was coming out and said, “It just happened.” “It” was the death of Papaw Lee. At the age of 25, I lost my first grandparent. No, I wasn’t sure exactly how I was supposed to feel, but I was – and still am – flooded with emotions and memories. Papaw put off obeying the gospel until his death was imminent. I’m thankful he had prostate cancer. Yes, I really am – had he not realized the shortness of his days, Papaw might never have put on Christ in baptism. A car accident, a heart attack, or an aneurism could have spelled death for, not only Papaw’s body, but his soul as well. Yet, in his illness, Papaw realized the seriousness of his situation and was clothed with Christ in baptism and was raised to walk in newness of life. I once heard a preacher say that he didn’t believe in conversions at the last moment of life. Really? He needs to tell Jesus that, for Jesus forgave that thief on the cross when the malefactor turned to Jesus with his dying breath. When I walked into the bedroom that Papaw and Nannie had shared for many years, Papaw’s lifeless body lay on his hospital bed. The one emotion in my heart was thankfulness. I was so thankful Papaw had obeyed the gospel, and I vividly remember vocalizing that praise. I remember my mother sitting beside me, looking at her father’s body, said, “Amen.” Amen, indeed. John “heard a voice from heaven saying, ‘Write this: Blessed are the dead who die in the Lord from now on.’ ‘Blessed indeed,’ says the Spirit, ‘that they may rest from their labors, for their deeds follow them!’” (Rev 14:13). The day before Papaw died, Dad called to say that the situation was dire and that I needed to come to Nannie and Papaw’s (it was always Nannie and Papaw’s house – and it still is in my heart). Nannie kept RJ, and I took him with me that morning. With RJ in my arms, I walked into the bedroom where Papaw was struggling mightily to stay on this side of eternity. When he saw RJ, Papaw raised up enough to kiss RJ on the cheek. That is the last conscious act I remember Papaw doing – I’m thankful for that, because I have a memory to cherish until my dying day. I remember how he paid us three boys five dollars a week to mow his lawn (not bad money in the middle 80s). Well, he paid Aaron and me to mow his lawn, and he paid Kyle, the youngest among us, to empty the bag on the back of his mower. Except Kyle almost never emptied the bag – Papaw did; he wasn’t going to allow his baby grandson to get out and work, but Kyle still got money as though he did work – that made me furious as a child, but I look back and laugh now. Papaw wasn’t content simply for Aaron and me to mow the yard – oh, now – he was out there with an eagle’s eye making sure that every blade of grass was cut to his specification. Papaw took great pride in that lawn. He kept an old Dawn detergent bottle full of gasoline. Any dandelion that came to life in his yard was going to be cut down with gasoline. “All flesh is like grass and all its glory like the flower of grass. The grass withers, and the flower falls” (1 Pet 1:24). The dandelion withered and fell in Papaw’s yard, trust me! Papaw believed one verse of Scripture more than any other: “Owe no one anything” (Rom 13:8). If Papaw received a bill in the mail, it was paid that day. No, I don’t mean that he wrote a check that day and placed it in the mailbox the next morning. He would write his check, stamp his envelope, place the stamped envelope in the mailbox, and put up the flag. Within fifteen minutes of checking the mailbox, any bills were paid, except the water bill. The water office was only a couple miles away; when Papaw got his water bill, he jumped in his car and he drove down to the water district’s office and paid that bill. Papaw had a love affair with Diet Rite soda, a love affair, that for the life of me, I could never understand. He and Nannie kept Diet Rite because Papaw loved it. If I were at his house, he would tell me there was Diet Rite in the refrigerator; he would remind me that the product was calorie free, soda free, and caffeine free. I always wanted to add “taste free,” but I didn’t. Papaw loved to raise his garden: fresh yellow squash and lettuce and zucchini and peas and corn and green beans and green onions and tomatoes. I grew up eating fresh fried zucchini and perfectly prepared green beans and peas and corn and killed lettuce. To this day, I will not eat green beans that are bought in a can at the store. After eating Papaw’s green beans that Nannie prepared, everything else pales in comparison. When Papaw came to our house, he would always bring a candy bar for all three of us boys: most often a Baby Ruth or a 3 Musketeers. I ate a Baby Ruth bar not terribly long ago, and the memories of Papaw came flooding back. After Papaw had given us our candy bars and talked to Mom and checked to make sure everything was okay, he would give all of us boys a big wet kiss on the way out the door. Gross! I always wiped it off. Today, I would most gladly take one of his sloppy kisses. Papaw came to our house just about every day. Mom had ordered some Mary Kay, and she had just put on a mud mask. She came up the hall just as Papaw walked in the front door, and Papaw thought he had just seen a ghost. He jumped and let out a little yell before he realized it was simply his daughter with a mud mask. Papaw taught his four grandchildren (us three boys and our cousin) not to lie. You see, Papaw lost a finger in a work accident some years before I was born. We didn’t know that growing up. Papaw told us that he had told a lie and the bogeyman came in the middle of the night and took that finger. That was all the encouragement we ever needed to tell the truth. It’s possible that Papaw suffered from my neurological disorder himself. Whenever I wear shorts, my wife says that my legs remind her of Papaw’s: greatly atrophied of muscle. Papaw had a host of health issues. The story was that he had polio as a child, but my neurologist says that he sees many patients with the same story but really suffer from hereditary spastic paraplegia or dystonia or some other similar condition. Hopefully, my genetic test will show whether or not Papaw suffered from my condition; the only reason I really want to know is that that knowledge could help my family know who needs to watch for what symptoms – Mom’s cousins and a host of others might need some testing. In my heart, I really believe Papaw had polio; Mom says he remembers being sick as a child, and that points to polio, not some genetic condition. Papaw had a proud heritage. His last name was Lee, and he wanted you to know to know that we descended from the Virginia Lees – yes, those Lees who came from Stratford Hall. We are descended from Thomas Lee, Governor of the Virginia Colony under King George II, and we’re related to the Virginia Gentleman, General Robert E. Lee. I’ve stood in front of Lee’s crypt a few times, and as I stand there, I’m drawn to the history (I absolutely LOVE Civil War history, and Virginia is a marvelous place for that), but I also think of my Papaw’s pride in being a Lee. Lee was not the greatest name Papaw ever claimed. He confessed and claimed that name of Jesus and obeyed his precious Word. 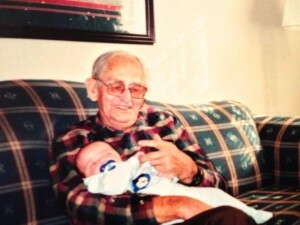 I’m thankful today to know that Papaw rests safely in the arms of Jesus, and one sweet day we’ll be reunited. This entry was posted in Evangelism, Faith, Family, God, Hope, Jesus, neurologist, Worship and tagged Bible, Family, God, Jesus, Jesus Christ, truth. Bookmark the permalink.